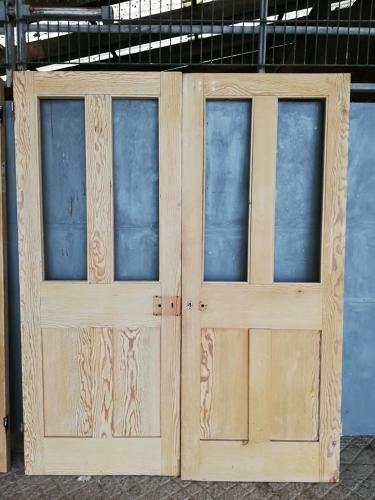 A pair of Victorian internal pine doors. The doors are four panel, with the two top panels ready for glazing. We can provide a quote for glazing, please contact us for details. The pine has a good colour and attractive grain. One of the doors is stripped to bare wood and one appears to have a matt varnish finish. The doors were originally individual but are of a similar size and do match. Please note the doors will need the heights levelling, we have provided the suggested height below. We can set up a rebated edge by cutting in to the door or adding a baton, please contact us for a quote for this service. The doors have some slight wear and signs of use due to age. The pine has some scratches and marks. The door hardware has been removed, leaving some marks and holes. We can patch repair the doors for an extra charge, please contact us for further information. There are some small knocks and chips. Substantial and well made Victorian doors, ideal for a period property.